Los Angeles, November 22, 2009 -- Ailing automaker GM revealed a radical new direction for its troubled HUMMER brand with the launch today of the HUMMER Wee at the 2009 Los Angeles Auto Show. The HUMMER Wee, according to GM spokesman Putney Shiphlick, "provides a winning combination of old-time machismo and trendy modern environmental do-gooderism". Mr. Shiphlick said GM is counting on the HUMMER Wee to revive the moribund brand in the face of mass desertions by consumers in favor of smaller, more fuel-efficient vehicles. "What we wanted to do," Mr. Shiphlick said, "was to create a version of the HUMMER that would keep its now classic, boxy, heavyweight styling, but with better mileage. So we scaled the whole thing down to 1/4 size and half the weight. Bing, a 28% improvement in mileage, making the HUMMER Wee competitive with a mid-size sedan such as the Chrysler Booty." Powered by a 1.4 liter four-cylinder fuel-injected gasoline engine, the HUMMER Wee produces a respectable 98 horsepower at 5000 rpm, enabling it to accelerate from 0-60 mph in 10.2 seconds. Mr. Shiphlick said GM rates the model's fuel consumption at 21 mpg highway, 16 city, a vast improvement over the somewhat thirsty original HUMMER, which at 1.5 mpg highway, 0.5 mpg city generally ranked among the lowest in the full-size SUV segment. "It feels really good to finally be producing an environmentally responsible product," Mr. Shiphlick said, "but at the same time one that's not going to deprive a driver of his or her masculinity." Given the diminished size of the HUMMER Wee -- the model is rated for a maximum driver height of 4 feet 6 inches -- Mr. Shiphlick said GM does not expect vast sales of the HUMMER Wee, but sees the groundbreaking model as more of a public-relations device. "It's the flagship of our new fuel-saving direction," Mr. Shiphlick said. "And if you happen to be vertically challenged, it's one hell of a sweet ride." 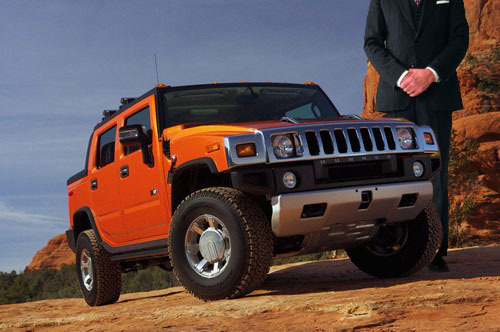 GM plans to release the HUMMER Wee to consumers in the spring of 2010. GM shares rose 2.3% on the announcement.